Now a well established part of the Titleist bag range, the updated Titleist Lightweight Cart Bag has had a facelift for the new season. As with previous models the Lightweight Cart has been stripped back to the bare essentials leaving only what is required, yet without sacrificing quality. Certain to be a popular option, this new model is available in 4 colour ways. The perfect choice for the golfer who likes to use a trolley and wants something lightweight with a sleek modern design delivering masses of brand appeal. All 10 of the zippered pockets are easily accessible while the golf bag is situated on either a motorised or 'pull' trolley. Ideally located grab handles allow for ease of manoeuvrability and transportation to and from your trolley. 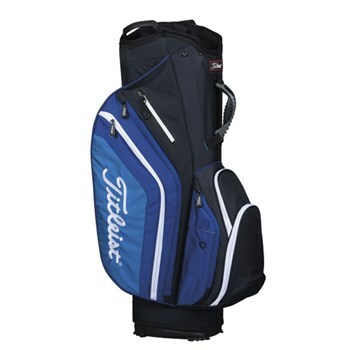 This bag will appeal to the player seeking the ultimate in golf bag capacity and organisation.